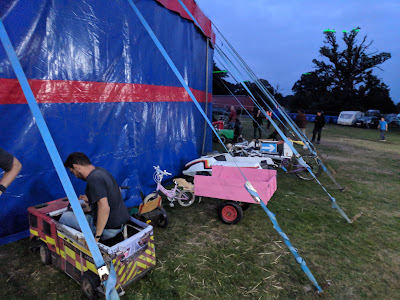 It's taken me some time to get round to writing up the Sinclair C5 at EMF Camp. Perhaps that ought to be a one of my new years resolutions? Any way on with the writeup! 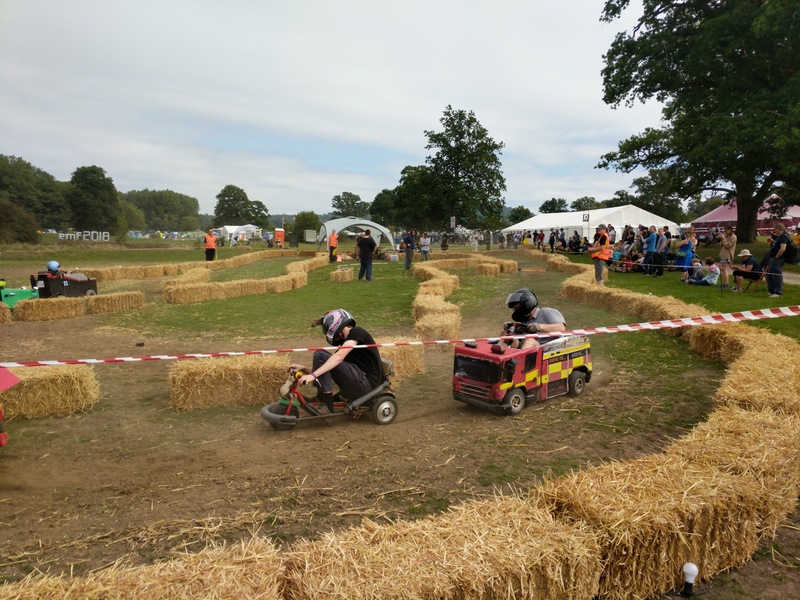 One major concern I had was how was I going to transport the Sinclair C5, my tent & camping gear as well as all the extra widgets I wanted to bring? I also offered to give a friend a lift so needed to fit in all of her luggage too! As I live in Cambridge, UK I have no need for a personal car. The public transport is dire compare to London but works well enough and everywhere is very accessible by bike (or Sinclair C5!) However I wasn't planning on building a trailer and somehow cycling from Cambridge to Eastnor (~135 miles). Instead I hired a van and hoped the Sinclair C5 would fit inside! Luckily the one I ended up getting did, I had to remove the boot but it just fit inside and didn't have any room to move around much! 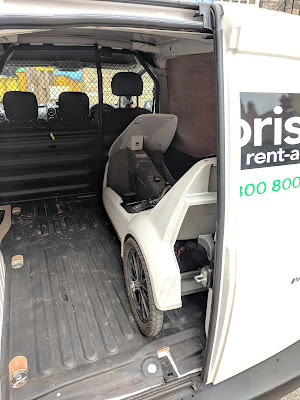 I had a few last minute jobs to try and make the Sinclair C5 Hacky Racers legal which involved adding a fuse, power kill switch and a spot for the transponder. I used Fusion 360's very useful canvas feature to take a picture of the rear of the Sinclair C5 and then sketch on attachment points for these parts. 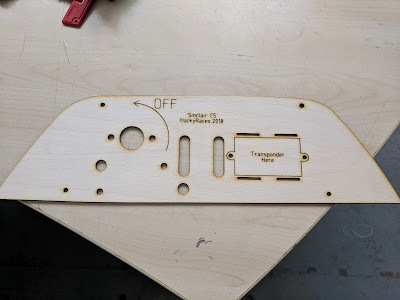 I then laser cut this out of 3mm laser plywood on one of Makespace's laser cutters. Everything fit brilliantly first time and I was thrilled with how it turned out. The self tapping screws went straight into the original holes in the Sinclair C5 chassis. 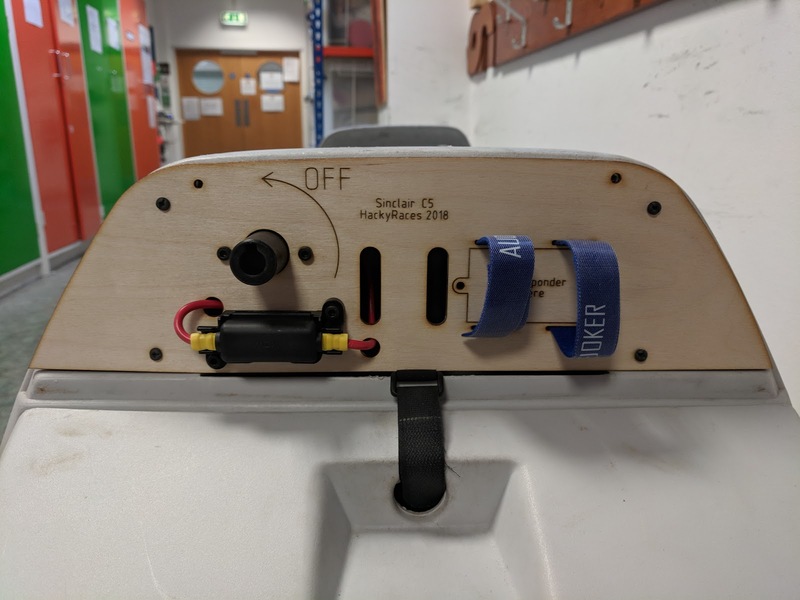 The fuse holder and wires fitted really well into the holes I'd placed, the killswitch fit perfectly and the "OFF" sign was pointing in the correct direction and clearly marked what to do. The velcro tie points for the transponder worked really well and I was all set for EMF Camp. 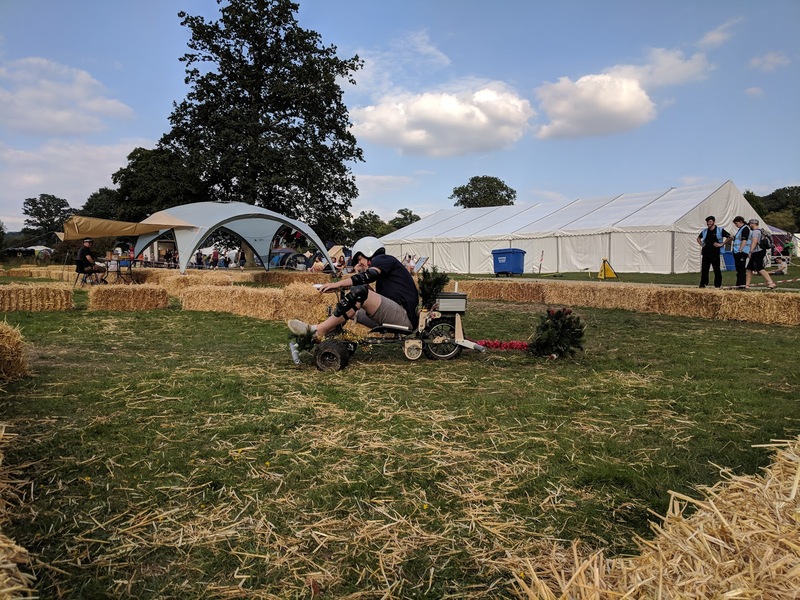 Unfortunately the Sinclair C5 is not designed for racing. The wheelbase is too long and it just can't corner quickly at speed. The poor design of the original chassis makes it really hard to race in and my modifications today haven't helped much with the handling. This made driving round the courses rather challenging. The VESC speed controller also would often go into thermal overload which would stop the motor entirely until it cooled down. 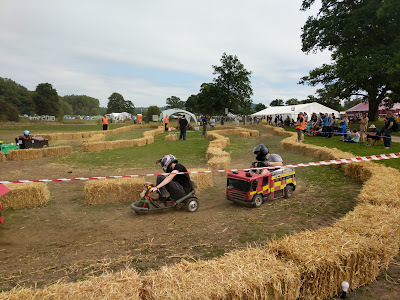 Regretfully I pulled out of the Hacky Racers but continued to assist and roam around the campsite on the Sinclair C5. Which went really well right up until the gearbox mysteriously locked up around lunchtime on the last day. Saddened I had to pack it away in the van for the return trip. It was the wide verity of silly vehicles all collected together in an organised parking lot. 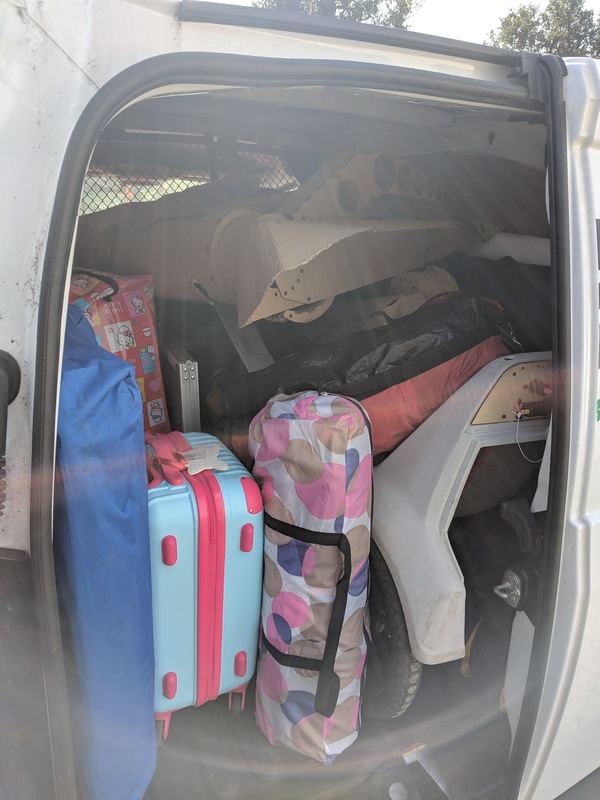 This is a good picture of how packed the van was for the trip home. Eventually once I got home I got round to taking apart the locked up gearbox to see what was wrong with it. 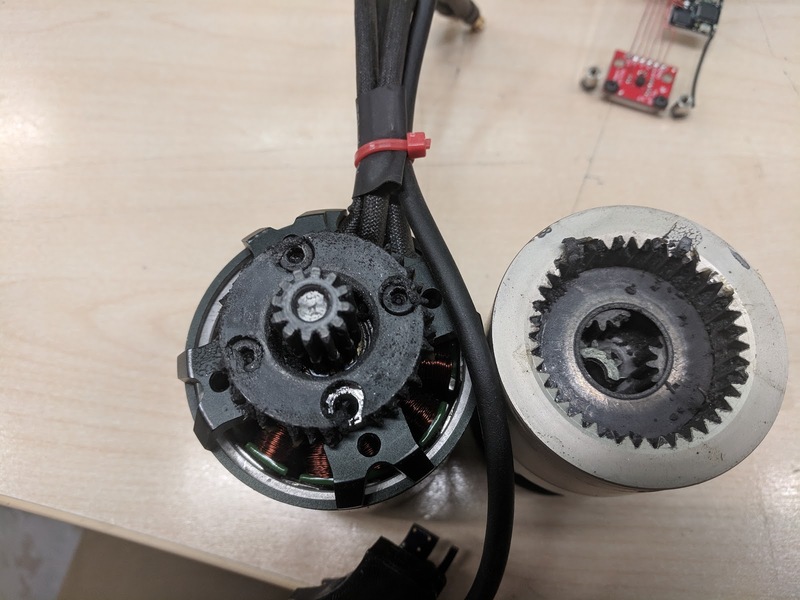 Hmmm that doesn't look good, those pieces of planet gear in the planetary gearbox. Oh dear, that's not what a planet gear is meant to look like. It's literally exploded! Once I cleaned up the pieces I found another problem! So in addition to one of the planet gears shattering it appears that the pins on the carrier plate have worn though most of the planets which is probably why one of them cracked. I'm hoping that this is because these planet gears are the original gears that came with the planetary gearbox and they were not particularly well made. 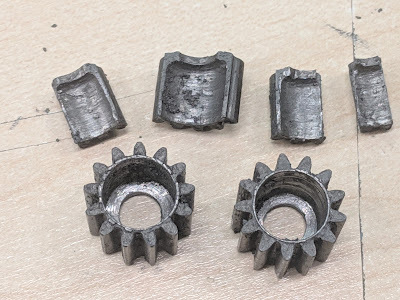 Either poorly machined or poorly hardened. I'm hoping that I'll be able to replace them with higher quality planet gears. If that doesn't work then I'm going to have to come up with another scheme to reduce the power. 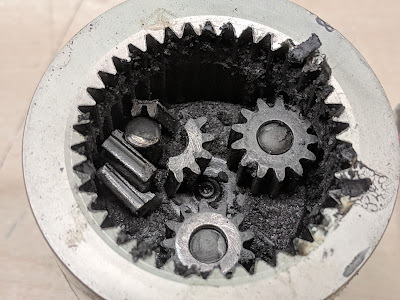 I may have to return to using spur gears. But until I get this fixed, the Sinclair C5 is off the road.